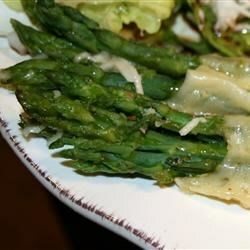 "Tender asparagus spears are rolled in prosciutto and cheese, and topped with a crunchy breadcrumb and grated cheese crust. I recommend using pencil-thin asparagus." Bring a large pot of water to a boil. Lower asparagus into the water, and cook for 1 minute, 2 minutes if the spears are thick. Lay one slice of meat on a plate. Layer a slice of cheese on top of the slice of meat. Place 3 to 4 asparagus spears at one end of the cheese and meat, and sprinkle with black pepper to taste. Roll the cheese and meat up over the asparagus, and secure with a toothpick. Place asparagus rolls in a casserole dish. Once all of the asparagus rolls have been arranged in the casserole dish, pour melted butter over the entire dish. Sprinkle with bread crumbs and Parmesan cheese. Bake for 15 to 20 minutes, or until the crumb mixture has formed a crust over the asparagus rolls. Add savory spice and bacon to your pizza!